These quick radish and cipollini onion pickles can be served with a variety of dishes to add a touch of acidity and sweetness. Bring the salted water to boil. 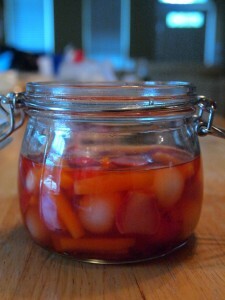 Add the onions, radishes, and carrot, and let boil for 4 minutes. Drain and place vegetables into a shallow non-reactive bowl. In a small non-reactive saucepan, heat the vinegar, peppercorns, sugar, salt, and cayenne over medium heat until the sugar and salt are dissolved. Pour the vinegar mixture over the boiled vegetables. Let cool, then chill slightly before serving. Store in a sealed glass container in the refrigerator for up to one week.